Now that you have the perfect wedding gift, it’s time to craft a sweet, heartfelt, funny, or insightful message to your newlywed pals. Need a little wordsmithing inspiration? 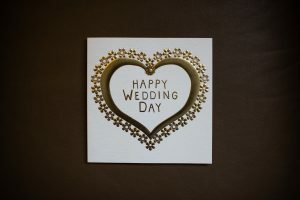 Here’s our guide to writing a great wedding card. 1. A big thank you. Being a part of a couple’s wedding festivities is a special kind of honor, so thank the couple for including you. 2. Welcome to our family. If appropriate, welcome your new sister-, brother-, daughter-, son-, cousin-, auntie-, or uncle-in-law to the family! 3. The moment you knew they were meant to be. Close to the couple? Reflect on the moment you looked at your pals and knew they’d be together forever. 4. Compliments on the couple’s relationship. Reflect on the strength of their relationship and their best qualities. Why do they make a good pair? How do you know their marriage will last? Let them know. 5. Reflections on how to have a lasting marriage or a great quote. If you’re long-married yourself, considering offering a piece of advice that has helped you through good times and bad. If you’re not sure what to say and Pablo Neruda already said exactly the words you’ve been searching for, go ahead and quote him. 6. Heartfelt wishes for a great wedding day and a happy marriage. Share your deepest, most heartfelt wishes for a happy and successful wedding day, and wish the newlyweds all the best in their new life together. Optional: Sorry I missed it. If you couldn’t make it to the wedding, thank the couple for the invitation and wish them the very best!